J Exp Med. 2018 pii: jem.20180421. doi: 10.1084/jem.20180421. The activation of Ca2+-mitochondria pathway drives cell division in hematopoietic stem cells, and the level of its activity is critical to determine cell fate after HSC division. 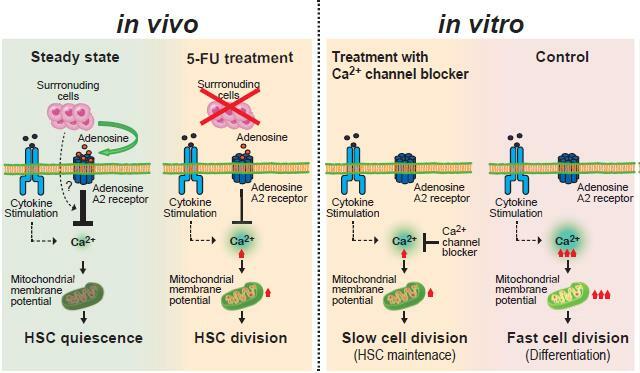 Extracellular adenosine contributes to the regulation of Ca2+-mitochondria pathway in HSCs in vivo. Most of the hematopoietic stem cells (HSCs) within the bone marrow (BM) show quiescent state with a low mitochondrial membrane potential (ΔΨm). In contrast, upon stress hematopoiesis, HSCs actively start to divide. However, the underlying mechanism for the initiation of HSC division still remains unclear. To elucidate the mechanism underlying the transition of cell cycle state in HSCs, we analyzed the change of mitochondria in HSCs after BM suppression induced by 5-fluoruracil (5-FU). We found that HSCs initiate cell division after exhibiting enhanced ΔΨm as a result of increased intracellular Ca2+ level. Although further activation of Ca2+-mitochondria pathway led to loss of HSCs after cell division, the appropriate suppression of intracellular Ca2+ level by exogenous adenosine or Nifedipine, a Ca2+ channel blocker, prolonged cell division interval in HSCs, and simultaneously achieved both cell division and HSC maintenance. Collectively, our results indicate that the Ca2+-mitochondria pathway induces HSC division critically to determine HSC cell fate.